1. 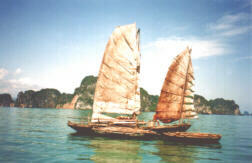 Have you ever traveled by a sampan or a small boat? 2. How many places do you want to travel to by boat? a. Tokyo, what would you think of? c. how about Karachi and a typical dish in Pakistan? d. how about Mexico and a spectator game most people of Latin culture enjoy? Now listen to the song, Chiếc thuyền nan, to validate what you have thought or guessed what this song is about.